The Tel Aviv Magistrates’ Court held last Wednesday (October 2) an evidentiary hearing in the criminal trial of Communist Member of Knesset (MK) Mohammed Barakeh, head of the Democratic Front for Peace and Equality (Hadash/Jabha). During the hearing, the court heard two witnesses for the defense. 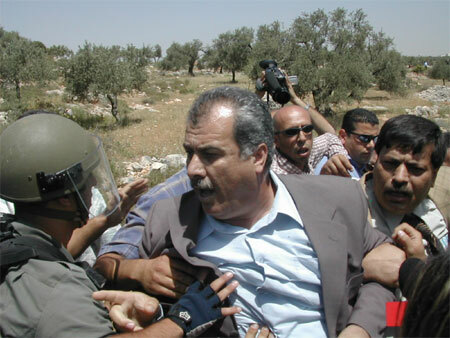 The witnesses gave their testimonies regarding charges made against MK Barakeh following his participation in a protest demonstration in Bi’lin against the Separation Wall in 2005. The witnesses refuted the charge of assault made against Barakeh, allegedly for attacking a border policeman while trying to prevent an arrest of an activist. MK Barakeh is represented by Adalah Attorneys Hassan Jabareen and Aram Mahameed. Director and photographer Shai Carmeli testified first regarding an hour of video recordings that he made during the events. The recordings show MK Barakeh being hit on the foot by a stun grenade that exploded besides him, and then being evacuated by ambulance. They also show Israeli soldiers and mista’aravim (undercover soldiers), attacking and arresting demonstrators. Carmeli testified that MK Barakeh was not present at the scene of this event, contrary to claims made by the police. MK Barakeh’s trial will continue in the Magistrates’ Court on 27 November 2013, when the prosecution and defense will make final arguments. This indictment is the first of its kind in Israel, whereby a member of parliament is charged in connection with his or her participation in a demonstration. According to the Communist Party of Israel this trial is a continuation of the persecution and attempts to de-legitimize the political activities of the Left activists and the Arab public through prosecution and criminalization of their political representatives. The testimonies further confirmed that the prosecution must withdraw the indictment. The Court has already dismissed two of four charges against MK Barakeh, deciding that they fell within his parliamentary immunity. The dismissal of the two charges occurred during the preliminary proceedings in the case, i.e. before examination of the substance of the charges against him. This fact shows that the indictment is weak, flimsy and should be dismissed in full.